CLEVELAND, Ohio — It would be easy to greet Cleveland Mayor Frank Jackson’s new vision for the downtown Cleveland lakefront with skepticism. After all, it’s the latest of more than half a dozen plans over the past 25 years that contemplated everything from building a floating hotel shaped like the Titanic to reconfiguring miles of shoreline with new islands made of landfill. Despite all the grand visions, the downtown lakefront remains a half-realized dream – and a chronic wasted opportunity. Granted, a lot has been accomplished. In a burst of action starting in 1995, the city completed a collection of attractions on the shoreline, including the Rock and Roll Hall of Fame and Museum, the Great Lakes Science Center and Cleveland Browns Stadium. But lakefront development has stalled since then, leaving the architectural icons of the 1990s standing isolated amid a barren landscape of parking lots and lifeless streets and parks. Despite the malaise, there are good reasons to take Jackson’s new plan seriously. Most important is that it isn’t so much a cascade of wildly original ideas as it is a collection of the most logical and sensible concepts for the downtown portion of the lakefront that have surfaced in earlier plans. This is not to suggest that the designers involved, EE&K of New York and Van Auken Akins of Cleveland, have plagiarized their predecessors. On the contrary, the designers this time around appear to have arrived at their recommendations independently. This gives all the more credence to their conclusions, the most important of which is that there’s plenty of room for private development and ample public space on the waterfront. In fact, the numbers sound impressive. The designers believe there’s ample space for 3.5 million square feet of development on 55 acres of waterfront land along two linear miles of shoreline that weave in and out from Dock 28 north of the stadium to the west end of Burke Lakefront Airport. The plan also includes miles of bike paths connecting the waterfront to the downtown core and roughly two miles of public promenades on the water’s edge. Public spaces of high quality could be woven throughout three distinct waterfront zones from the Port of Cleveland to Burke. All of this is good news, because it means the city could finally realize a greater degree of private-sector payback from the massive public investments lavished on the shoreline attractions in the ’90s. What’s different about the new plan is that the city and the Cleveland-Cuyahoga County Port Authority have clarified the ownership and management of key parcels around the harbor, which could facilitate development. In addition, the new plan is emerging amid a greater sense of certainty about what’s possible, and what’s not possible, on the lakefront. possibilities and allowing the city to focus first on the strong opportunities around North Coast Harbor. Also, Jackson has come down firmly against the idea of closing Burke Lakefront Airport and either turning it into a park or a vast real estate development. That position also makes sense. With millions of square feet of vacant office space in the core of downtown, it doesn’t seem like the best time to open up a huge new area for development along the lakefront at Burke. It makes more sense, instead, to capitalize on the investments already made in the ’90s, such as the Rock Hall. 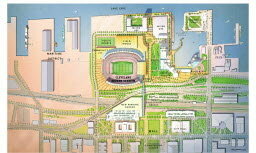 In many ways, Jackson’s plan represents a continuation of the ambitious lakefront plan completed in 2005 by his predecessor, Jane Campbell. But while the Campbell plan provided an important framework for future decision-making about all nine miles of city lakefront, it was less specific about how to get things started in discrete locations. Under the new plan, Jackson has a more plausible road map about how to get started and keep moving on the downtown waterfront. Small but important pieces of the new vision have a decent chance of happening within three to five years, either because the projects are already funded with federal money or could attract private investment. These include a pedestrian bridge at North Coast Harbor designed by Boston architect Miguel Rosales (another legacy of the Campbell plan), a pair of waterfront restaurants, more on-street parking on the East Ninth Street Pier and a marina for pleasure boats north of the Rock Hall. If those elements come into being relatively soon, the city could create a sense of forward motion around the Rock Hall, which could attract bigger pieces of proposed development, such as office complexes proposed for chunks of land west and east of North Coast Harbor. waterfront. It’s counting on the federal government for an $80 million grant to pay for transportation improvements at the port and for a pedestrian bridge from the north end of Mall C to North Coast Harbor and the Rock Hall. Chris Warren, Jackson’s chief of regional development, described the process of winning such a grant as “enormously competitive,” which sounds daunting. But other parts of the plan sound eminently doable, such as creating new parking spaces on the East Ninth Street Pier as a way to make the area more accessible on a casual basis and more like a regular city street. The computer graphics created by EE&K and Van Auken Akins for Jackson’s lakefront plan look deceptively smooth and polished. The reality is that the plan will take two decades or more to complete and will undoubtedly evolve over time. New plans will probably emerge as the city’s circumstances change. For now, Jackson’s plan provides a good framework for steps the city can take in the near term. It’s crucial that the mayor and his team deliver on what they’ve envisioned. If they can’t, the city’s lakefront will continue to stay frozen, largely as it was at beginning of the last decade.